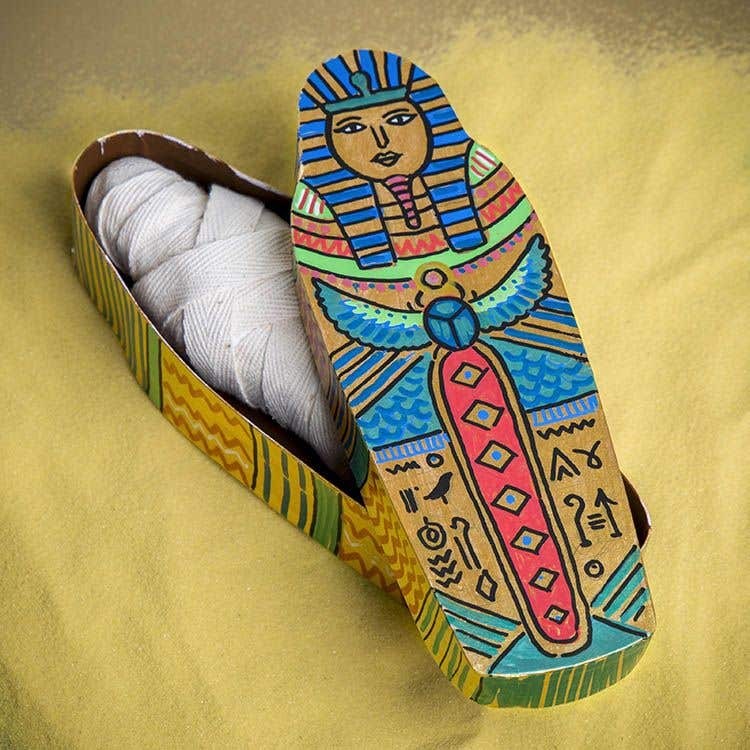 Create you own sarcophagus with a mummy inside! This is an ideal class project to accompany lessons on Ancient Egypt to help children understand how the Egyptians viewed the afterlife. 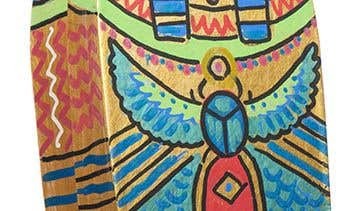 The sarcophagus boxes can be decorated with hieroglyphics and other images using traditional colours. This activity compliments the Canopic Jar project. To make the mummy, shape some air-drying clay into a ball about the size of an apple, approximately 8cm in diameter. Gently squeeze the clay into a long shape, pressing along one half to make it thinner for the mummys legs. Roughly shape the clay into a head at the top. 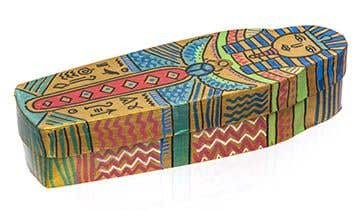 Check it will fit inside the sarcophagus box, it needs to be about 15cm long x 3 cm deep. Leave the clay dry overnight. Brush black paint inside the box and lid. Leave to dry then paint the outside of both sections gold. Leave to thoroughly dry. Use a pencil to lightly draw the mummys face and some patterns onto the lid. You could include Ancient Egyptian patterns and symbols like hieroglyphs, scarab beetles, zigzags, stripes, dots and scales. Add some guidelines for more patterns on the box. Colour in the patterns with deco pens, metallic pens or acrylic paints, leaving some of the gold showing through. When the colours have thoroughly dried, use a black deco pen to outline the design. 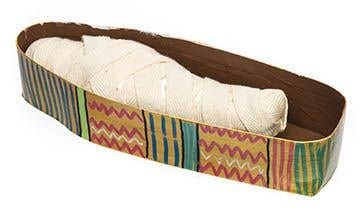 Lightly brush some glue over the dried clay mummy, then wrap it in a 1.5 metre of cotton or masking tape. Wind the tape it diagonally one way then back in the opposite direction with some extra glue at the end to hold the cotton tape in place. You could also use a cotton bandage or a strip of white crepe paper. To make drawing on the sarcophagus lid easier, raise your hand by resting it on a thick book to help keep your hand steady.